Hello Monday! Happy Summer Solstice, which to me means more time to eat ice cream on the porch and sneak in an extra glass of wine. If you have the same idea that I do, have I got a recipe for you. 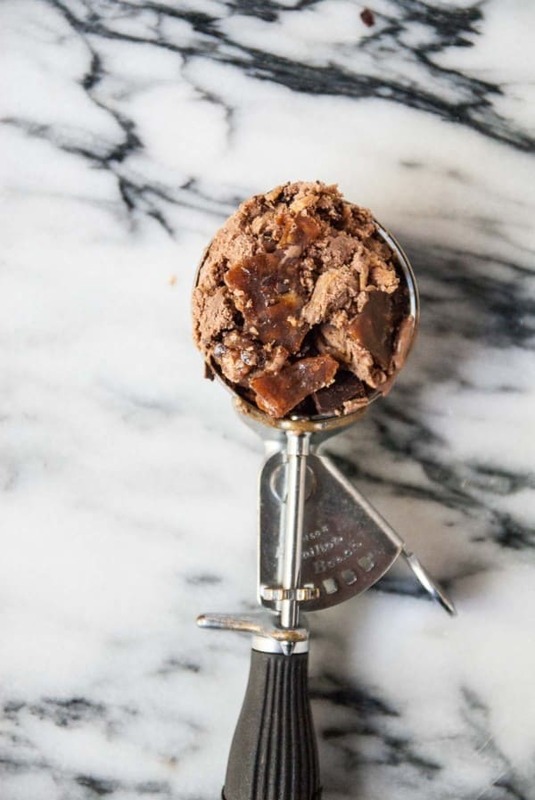 I almost went the fruity route when I was thinking about adding an ice cream recipe, but instead decided to load a chocolate ice cream base with chunks of dark chocolate, pieces of praline crunch and lots of peanut butter. The result is a mix of vegan praline crunch ice cream with just a little extra something to push it over the edge. 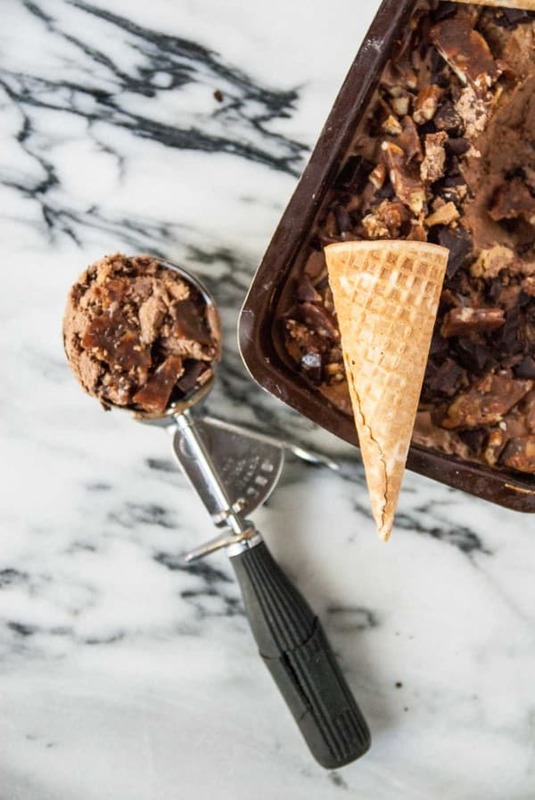 Personally, I like my ice cream to have lots of chunks of things, as opposed to being the kind where you have to dig around for the good stuff (I’m guilty of picking out the chunks of things in ice cream and then discarding the plain ice cream, whoops!). This covers all the bases of a good vegan ice cream, with a creamy texture that is made easy with full fat coconut milk, easy prep and lots of extra mix ins, no digging required. I’m pretty proud of this ice cream recipe because it involved trips to three grocery stores, two days of attempting the recipe and one very fast photo shoot that involved trying to take pictures in 90 degree heat while ice cream melted all over my dining room floor. My first batch of this praline crunch ice cream was just a little too icy a wasn’t freezing up properly after churning. So, back to the grocery store I went, in search of the best full fat coconut milk that was going to result in a creamy texture, without being overly rich. In the end, I found that Trader Joe’s coconut cream worked best for me (it’s in the brown and white can), but if you don’t have a TJ’s close to you, I know Whole Foods has a solid option as well. Coconut cream is technically a whole different thing than coconut milk, but when I compared the fat content of a can of coconut milk to coconut cream from TJ’s, they ended up being the same. Just know you are looking for something in a full size can, not the little can of coconut cream! I also 100% recommend that you churn this ice cream, but if you give it a go without an ice cream maker, let me know, I would love to see how it comes out without one. Needless to say, I’m really proud of finally nailing this praline crunch ice cream recipe, it’s so dang good! Want even more ice cream recipes? 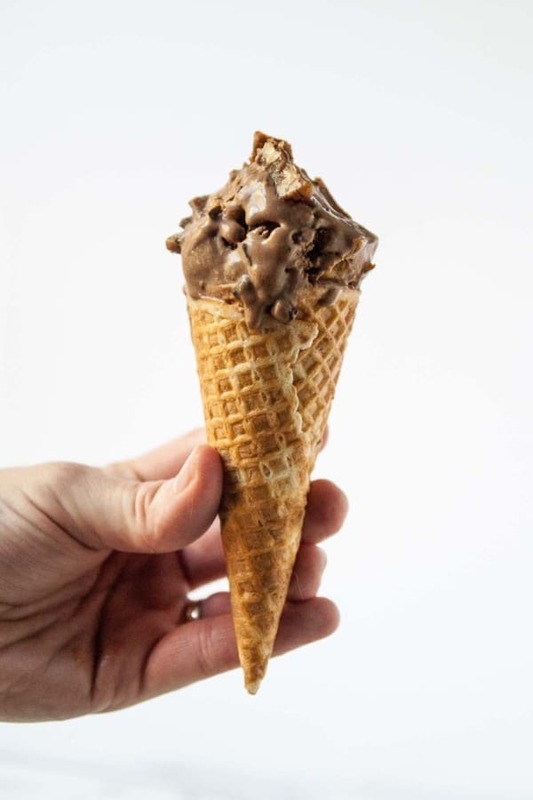 I’m collaborating with a group of bloggers to bring you a whole week of ice cream recipes and a giveaway for Ice Cream Week (with goodies from Rodelle, Cusinart, and Tovolo). Don’t forget to enter the giveaway and visit all of the other blogs posting ice cream recipes, which you can find over at A Cookie Named Desire! Happy Monday indeed. First, don’t forget to freeze your ice cream maker bowl at least 24 hours in advance! In a blender, combine the coconut milk, cane sugar, cocoa powder, and vanilla extract. Transfer the mixture to your ice cream maker and churn according to manufacturer instructions. Mine took about 25-30 minutes, but it depends on your maker. While the ice cream is churning, prepare the peanut butter mixture and pralines. In a small bowl, whisk together the peanut butter, maple syrup and coconut oil. Set aside. Line a cookie sheet with parchment paper, set aside. In a medium saucepan combine the cane sugar, coconut milk, and coconut oil Heat over medium heat and stir constantly with a wooden spoon for about 3- 4 minutes. The mixture should start to thicken and smell like caramel. Make sure you are scraping the bottom of the pan with the spoon, you don’t want it to burn! Stir in the chopped pecans and cook for an additional 30 seconds to 1 minute, until the mixture thickens a bit more. Transfer the caramel to the lined cookie sheet, spreading out evenly on the parchment paper. Place in the freezer to cool for at least 15 minutes. After it is cool, cut the praline into small pieces and set aside. 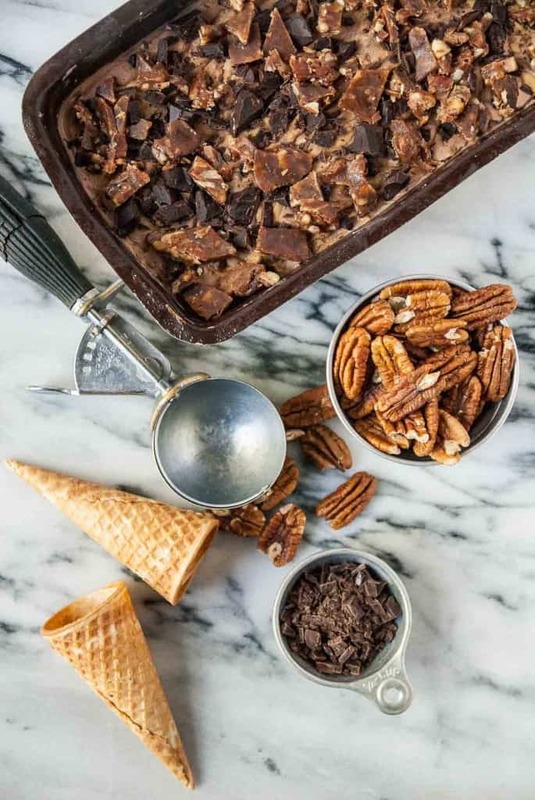 Fold in the peanut butter, chopped chocolate and praline pieces to the ice cream after it has churned. Transfer to a loaf pan and freeze for at least 2 hours. So I think you, me and Sara all need to trade our salty, sweet, nutty ice creams. Also, love that shot of you holding the cone! So good! That crunch sounds perfect! You’ve hit all the taste-buds! OMGee Abby! This is jam packed with the good stuff! I’m completely in love… because I’m guilty of diggin around too. I applaud your efforts to make the creamiest ice cream… I’ve not mastered a creamy no churn yet.. as I recommend churning as well. Three trips to the store was well worth this my dear! Ha, I’m glad I’m not the only one! I know it annoys the crap out of my hubby, but I want the good stuff! I still can’t master the no churn, churning just makes it so much better! SO AWESOME! I’m totally with you on all the mix-ins, the more the better!!! And the peanut butter swirl… SWOON. I’m so so into it. SO MUCH YUM! The chocolate-peanut butter experience is the best ever and I’m dying over this praline twist. This ice cream was definitely worth the trips to 3 different grocery stores, yes, ma’am! I obsess. This ice cream sounds like it would be good for a birthday party! Now who might be having a birthday soon???? Hmmmmmm. No you are totally right, it is kind of confusing! So you can go ahead and use full fat coconut milk, you don’t have to stick it in the fridge but it would actually help with the process since it would make the ingredients cold and speed the churning process along 🙂 I still haven’t found a no churn recipe that I like, so I’m with you on that one! Enjoy Trish! Please let me know if you have any other questions! I am so with you on bigger and more chunks in ice cream. In my world the chunks to ice cream base is about 50-50. Or at least close to it. This combination of peanut butter, chocolate and PRALINE is just beyond. I have to try this asap. Thanks for joining me this week!!! It says almond milk in directions but no amount is given. Can you tell me how much to use please? Hi Mary, so sorry about that! I have corrected the recipe! Is it possible to sub cane sugar with coconut sugar? I am sensitive to cane sugar. 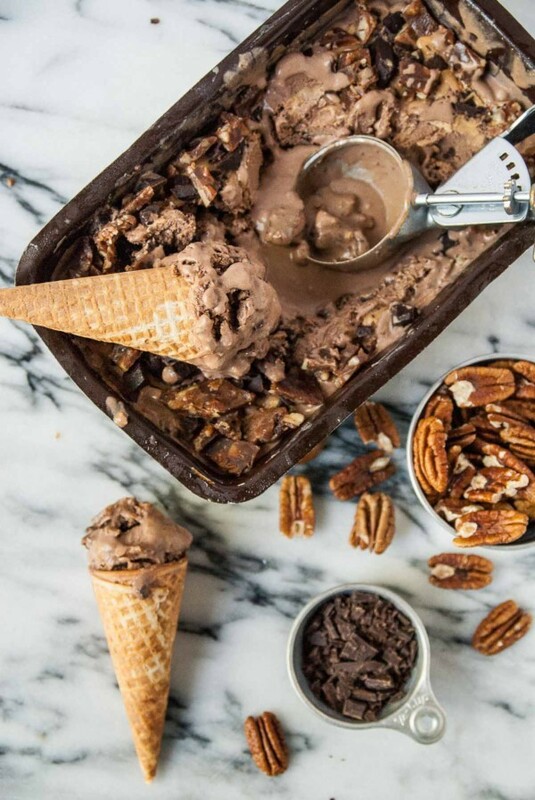 Do you add the peanut butter and pecans when the ice cream is almost done? don’t see it in the instructions. This looks amazing! And those mix-ins…how could you go wrong?! I’m ALL about the mix- ins!